This article is part of a Special Issue on ‘Fossil Fuel Supply and Climate Policy’ edited by Harro van Asselt and Michael Lazarus. The combustion of fossil fuels is by far the largest human source of global greenhouse gas emissions, releasing more than 30 billion tonnes of carbon dioxide (CO2) into the atmosphere each year (IPCC 2014). Reducing fossil fuel combustion is thus a top priority for climate policy. For decades, national policymakers and international agreements have sought to achieve this goal through promoting energy efficiency, low-carbon technologies, carbon pricing, and other measures aimed at reducing the demand for fossil fuels. Focusing on the point of combustion makes intuitive sense, but efforts so far have yet to put fossil fuel use on a trajectory consistent with keeping global warming well below 2 °C and pursuing efforts to stay below 1.5 °C, as suggested by the Paris Agreement. Recognizing this shortcoming, policymakers, investors, researchers, and civil society actors have begun to look at the supply side of the fossil fuel economy—and the potential for supply-side measures to complement demand-side climate policies. A key insight driving these new approaches is that the political and economic interests and institutions that underpin fossil fuel production help to perpetuate fossil fuel use and even to increase it. From this emerging vantage point, continued investment in fossil fuel exploration, extraction, and delivery infrastructure makes global climate protection objectives much harder to achieve. The focus on fossil fuel supply in climate policy has high-profile proponents. OECD Secretary-General Ángel Gurría has emphasized the challenge posed by decades of investment in fossil fuel supply and the “carbon entanglement” it creates, as governments depend on the profits they accrue (Gurría 2013). And during his final 18 months, US president Barack Obama took steps to begin constraining the expansion of fossil fuel production on climate grounds—the rejection of the Keystone XL pipeline, making the Arctic and Atlantic off-limits to further exploration and drilling and initiating a programmatic review of coal leasing policies (White House CEQ 2014; The White House 2015, 2016). The intersection of climate policy and fossil fuel production is also the subject of a growing body of research (Harstad 2012; Asheim 2012; Hoel 2013; Collier and Venables 2014; Lazarus et al. 2015; Gerarden et al. 2016; Muttitt et al. 2016; Fæhn et al. 2017; Day and Day 2017; Eichner and Pethig 2017). Studies have examined, for example, the extent to which achieving climate protection objectives would dramatically curtail fossil fuel profits, or “rents” (Bauer et al. 2013), and render a significant fraction of coal and unconventional oil reserves and resources “unburnable” (McGlade and Ekins 2015; Bauer et al. 2015). Researchers and financial advisory institutions have also highlighted the risk that climate and broader environmental concerns might lead to the premature retirement of fossil fuel reserves and supply infrastructures—and thus result in “stranded assets” and associated financial losses for investors and governments (Leaton et al. 2013; HSBC Global Research 2013; Caldecott et al. 2013; Hsueh and Lewis 2013; Clark 2015). At the same time, it is clear that fossil fuel producers—and the political and economic interests tied to them—can pose formidable obstacles to climate action (Erickson et al. 2015; Erickson and Lazarus 2015; Seto et al. 2016). With these considerations in mind, several economists have proposed and analyzed supply-side approaches to climate policy (Collier and Venables 2014; Harstad 2012; Sinn 2008). Climate activists are increasingly focusing on the supply side of the fossil fuel economy as well, rallying opposition to new fossil fuel supply infrastructure—from coal terminals and oil pipelines—and the development of new resources, from exploratory oil drilling in the Arctic to new coal mines in Australia (Piggot 2018). They have also spurred a movement that has spurred individuals and institutions to commit over US$5 trillion in assets to funds that a divested from fossil fuel companies (Ansar et al. 2013; Arabella Advisors 2016). Yet, despite recent attention, supply-side climate strategies have yet to gain a strong foothold in mainstream climate policy discourse. For example, Intergovernmental Panel on Climate Change (IPCC) reports as well as the multitude of nationally determined contributions to date have focused almost exclusively on demand-side approaches and have featured few if any supply-side measures (Piggot et al. 2018). This Special Issue thus aims to heighten awareness of supply-side policies and deepen understanding of their feasibility and effectiveness through a set of contributions that explore various supply-side policies and measures using a variety of lenses, including energy-economic modeling, political economy analysis, international relations theory, and ethics. Drawing on these contributions as well as other literature, much of which is relatively recent, this introductory article first discusses the challenge of addressing fossil fuel supply in the context of global climate goals, before elaborating rationales that underpin supply-side climate policy. Next, the article classifies a range of potential supply-side policies and measures and then explores the political and ethical dimensions of a transition away from fossil fuel supply. In our conclusions, we identify promising areas for further research. Investments in oil, coal, and gas exploration, extraction, and transport have averaged approximately US$1 trillion annually in recent years and are poised to exceed US$20 trillion cumulatively from 2017 to 2040 under the IEA’s New Policies Scenario (IEA 2016, 2017). As with other capital-intensive fossil fuel infrastructure, these investments can deepen carbon lock-in, perpetuating dependence on coal, oil, and gas for decades to come and putting climate protection goals further at risk. At the same time, these investments are increasingly exposed to risks of asset stranding, as nations contemplate more determined efforts to decarbonize through gradually more ambitious pledges under the Paris Agreement. Persistent low fossil fuel prices in recent years have slowed the pace of investment, driving oil and gas producers out of high-cost resources and forcing coal producers into bankruptcy. In recent years, researchers and investment advisors and regulators have sounded warnings to the investment community that fossil fuel supply investments may become “stranded” if they misread the extent and timing of climate policy and advances in low-carbon alternatives (Leaton et al. 2013; HSBC Global Research 2013; Fulton and Weber 2015; Clark 2015; Johnson et al. 2015). Their message has been amplified by the divestment movement (Ayling and Gunningham 2017; Gunningham 2017), which has urged investors—including churches, universities, and sovereign wealth funds—to stop investing in fossil fuel stocks. The flipside of stranded assets is the notion that carbon-intensive investments create dependencies, political and institutional interests, and economic advantages that make it more difficult to move to lower-carbon pathways and thus reduce climate risks (Erickson et al. 2015; Seto et al. 2016). Overcoming this lock-in requires more than switching to low-carbon technologies or building the necessary infrastructure (e.g., an electricity grid that can power a large number of electric vehicles). It will require overcoming fossil fuel incumbency and carbon entanglement in the broadest sense, including existing power relations between governments and fossil fuel industries, as well as changes in individual as well as social-structural behavior (Geels 2014; Seto et al. 2016). Governments in major fossil fuel-producing regions have yet to reckon fully with this challenge. As Mark Jaccard, James Hoffele, and Torsten Jaccard note in their analysis of Canadian oil sands in this issue, the disconnect between the 2 °C goal, existing commitments, and current actions creates a dilemma for national governments and their explicit or implicit support for major investments that could expand fossil fuel production and transport. Only very recently have governments taken first steps to connect climate constraints with restrictions on fossil fuel supply. In late 2015, US President Obama rejected the Keystone XL pipeline on the grounds that to address climate change, “we’re going to have to keep some fossil fuels in the ground rather than burn them” (The White House 2015). In late 2016, Canada joined the USA in a decision to cease new leasing of concessions for Arctic oil and gas production, citing the need for consistency with national and global climate and environmental goals (The White House 2016). And in 2017, the French government included a ban on new hydrocarbon exploration in their new climate plan (Bamat 2017). Similar moratoria on fossil fuel exploration were adopted or under consideration in Belize, Costa Rica, Ireland, and New Zealand. There is a host of policies to constrain future fossil fuel production that governments can pursue to help achieve the shared goals of the Paris Agreement. As we describe next, while they have yet to gain widespread traction, there are many reasons to give them serious consideration. If demand-side policies were ambitious enough and applied widely enough—for example, if binding, deep mitigation commitments covering the majority of global emissions were in place—they would suffice to achieve the 2 °C goal. Yet, the reality is that such policies have not yet materialized (Rogelj et al. 2016; UNEP 2017). As the urgency of the climate problem has grown, so has the need for a broader range of solutions. To that end, supply-side policies could offer several benefits as a complement to measures taken to reduce the demand for fossil fuels. First, applying supply-side and demand-side measures together may increase the scale of emission reductions available at a given marginal cost, in effect “widening” the mitigation cost curve, by broadening the portfolio of emission reducing measures available to policy makers. For instance, Fæhn et al. (2017) find that actions to reduce investment and production in oil fields could halve the cost of achieving Norway’s contribution to global emission abatement embodied in their emission reduction target for 2020. Through market effects, such actions could reduce global oil consumption and greenhouse gas emissions at a cost (of foregone profits) lower (on a per ton CO2 basis) than demand-side mitigation options that might otherwise be needed to reach the target. While mitigation costs are high in Norway due to its climate ambition and the dominance of transportation emissions, similar dynamics are likely to hold in other fossil fuel-producing regions. Indeed, as Peter Erickson and Michael Lazarus (this issue) show, the CO2 abatement costs associated with restricting coal leases could be well within the range of other options for achieving emission goals. Second, supply-side policies and actions will tend to slow investment in fossil fuel production and trade infrastructure, limiting the extent of carbon lock-in associated with fossil fuel over-production (2015). This, in turn, can (1) lower future mitigation costs, as over-production would otherwise make fossil fuels cheaper and harder to compete with; (2) reduce stranded asset risks and the consequent market and economic inefficiencies; (3) and reduce carbon entanglement and the sociopolitical influence of fossil fuel interests. Third, supply-side policies may increase moral pressure and public support for climate action, because action is more readily observable (e.g., closure or avoidance of coal mines or oil pipelines vs. energy efficiency actions spread across countless individual investments), actors are more readily identifiable (e.g., coal industry vs. investors in efficiency improvements), and consequences are relatively certain and exact (Collier and Venables 2014). The contribution by Fergus Green and Richard Denniss to this issue takes this argument further, positing that on three counts—perceived benefits, costs, and distributional fairness—supply-side policies have greater potential to mobilize public support than demand-side policies. Fourth, as Green and Denniss also remind us, restrictive supply-side policies are rooted in economic theory and have been used effectively in other contexts, tobacco being a prominent example. Because fewer projects and facilities produce fossil fuels than use them, regulating on the supply-side can also reduce administrative and transaction costs. Finally, supply-constraining policies may help to counteract the potential for resource owners—anticipating increasingly stringent future carbon policies and prices—to accelerate production in the near term, as suggested by Sinn’s “green paradox” (Sinn 2008), though some also question the overall strength of this effect (Bauer et al. 2018). Given the many reasons to consider supply-side policies, why have they been slow to enter the climate policy discussion? As noted above, the political obstacles can be tough to surmount. Policymakers can anticipate strong political opposition from powerful coal, oil, and gas interests towards actions that directly constrain their production. Indeed, as political economists have long noted, policies benefiting concentrated interests are hard to change even if the diffuse benefits are great (Olson 1967). At the same time, as shown by Philipp Richter, Roman Mendelevitch, and Frank Jotzo in this issue, some supply-side policies, such as taxes on production or exports, could be more attractive to supplying countries than taxes on consumption or emissions regulation especially by importing countries, as such measures could improve terms of trade and government revenue. For similar reasons, Ecuador proposed that oil producers impose a carbon tax on their exports (Harrison 2015). Furthermore, Green and Denniss (this issue) suggest that supply-side policies such a moratorium on new coal mines could garner unexpected support from actors within the fossil fuel industry, for instance by pitting incumbents against new entrants. The way that nations account for their carbon emissions—on a territorial basis—can also reduce the incentive to undertake supply-side measures as a means to meet climate targets. A nation that taxes coal exports but not domestic consumption, for example, might reduce coal consumption and emissions globally but, by indirectly encouraging domestic consumption, increase its own (Richter et al. 2015). Even though these and other supply-side policies could make important contributions to climate protection, because of how emissions are accounted, political leaders may have less incentive to implement them. One way to overcome this barrier could be to implement a parallel extraction-based accounting system (Harrison 2015; Steininger et al. 2016). Indeed, Harrison (2015) argues that shifting responsibility for carbon emissions from territorial accounting to the point of fossil fuel extraction (or final consumption) could facilitate international climate agreement. Common perceptions about the nature of fossil fuel markets and of the climate problem can reinforce the focus on demand-side policies. Policymakers and analysts often assume that if they reduce production in one location, an equal amount will be produced in another—the assumption of “perfect substitution,” which has been evident, for example in environmental reviews of energy infrastructure projects (see Erickson and Lazarus, this issue). However, in the absence of an actor capable of controlling prices, this assumption does not hold. As in other markets, reducing oil, coal, or gas supply will tend to increase price and thus reduce demand. While the Organization of the Petroleum Exporting Countries may still seek to operate as a price-controlling actor in the global oil market, its effectiveness is increasingly questioned (Van de Graaf 2017). Similarly, policies that reduce fossil fuel consumption can have a corresponding rebound or leakage effect, where prices decrease and stimulate added energy demand. Understanding the likely scale of rebound or leakage is important in evaluating the effectiveness of both supply- and demand-restricting policies (Greening et al. 2000; Schipper 2000; Fæhn et al. 2017). In some cases, price effects can mean that for every barrel of oil not produced, global oil consumption could decline by as much as half a barrel, suggesting that supply restrictions can be effective as climate policy (Erickson and Lazarus, this issue). In sum, supply-side policies—from removing fossil fuel subsidies, to taxing production, to retiring assets—have the potential to offer governments valuable new tools to achieve climate goals and deserve a closer look. Policies that focus on the supply-side may offer important opportunities to enhance the pace, effectiveness, and efficiency of the low-carbon energy transition. Examples of such policies include, among others, proposed moratoria on new coal mines, oil or coal export taxes, and compensation schemes for leaving fossil fuel assets in the ground. Table 1 illustrates the range of potential supply-side climate policy instruments—economic, regulatory, government provision of goods and services, and other—borrowing the classic typology used by the Intergovernmental Panel on Climate Change (IPCC). These policies can be implemented at the scale of individual investments (e.g., not building a coal port or oil pipeline), of (coordinated) national policies (e.g., reducing subsidies), or of collective actions or instruments by a coalition of countries (e.g., internationally harmonized fuel export limits or taxes, or international or linked cap-and-trade systems). Some could indeed become elements of national strategies and incorporated in future nationally determined contributions, though doing so would likely require new methods to estimate, if not directly account for, cross-boundary emission savings (Piggot et al. 2018). Carbon pricing and removal of fossil fuel subsidies are among the most widely discussed of climate policies and often advocated by economists as the first-best climate policy. Currently, most carbon pricing is applied at the point of fuel distribution or final use. Similarly, much of the discussion and implementation on fossil fuel subsidy reform has focused on consumer subsidies that reduce the price paid by businesses and households for fuel and electricity. However, the potential benefits of applying a carbon tax or cap-and-trade system on the supply-side and addressing subsidies to fossil fuel producers are also significant. Indeed, economists suggest that that the most efficient point of regulation for a carbon tax (or cap-and-trade system) would be upstream at the point of fossil fuel extraction. Doing so would ensure maximum coverage and results in lower administrative costs as there are far fewer entities that produce rather than process, distribution, or consume fossil fuels (Metcalf and Weisbach 2009). If imposed globally, a carbon tax imposed at the extraction stage would distribute more tax revenue to fossil fuel producers and developing countries in general than would a tax imposed at the combustion or product consumption stage (Karstensen and Peters 2017), which might help to compensate and thus bring fossil fuel producers on board for more ambitious climate action. Producer countries might also see advantages in taxing individual fossil fuels, notably coal. Richter, Mendelevitch, and Jotzo (this issue) compare the effects on global CO2 emissions and coal prices of a coal tax adopted, unilaterally, by a coalition of major coal exporters, by all exporters, and by all producers. They find that coal production taxes adopted by major coal producers would lead to further CO2 emission reductions and yield further revenues for these countries. Some economists have gone one step further to suggest that trading for rights to extract fossil fuels could have advantages over the more traditional systems that trade in rights to emit greenhouse gases (Harstad 2012), especially when coupled to a process for phasing out coal production (Collier and Venables 2014). They find that if such a scheme could be implemented across major producer nations, the oil industry could part with only a fraction of its profits and still compensate the coal industry for the closure of coal mines. Removal of subsidies for fossil fuel supply is another economic strategy that governments can pursue. Governments subsidize fossil fuel exploration and extraction to the order of 18 to 70 billion per year, depending on how subsidies are defined, an order of magnitude less than subsidies to fossil fuel consumption, but nonetheless significant (Bast et al. 2015; OECD 2017; Jewell et al. 2018). Producer subsidies can take many forms, from tax credits on exploration and production equipment, to direct payments per unit of output, to sub-market-rate leasing of nationally owned lands (Koplow et al. 2010; OECD 2013; Aldy 2013). By reducing the costs of finding and developing new oil fields and by increasing net revenues for the fuels extracted, these subsidies affect the economics of fossil fuel extraction; in the USA, for example, half of all oil production from new fields may depend on subsidies to be profitable (Erickson et al. 2017). Producer subsidies affect the quantity and pace of fuels supplied to regional or global markets. This means that their removal could ultimately reduce fuel consumption and CO2 emissions (Anderson and McKibbin 2000; Erickson and Lazarus 2013; Lunden and Fjaertoft 2014), though researchers may come to differing conclusions about the extent and significance of impact (Allaire and Brown 2012; Jewell et al. 2018; Metcalf 2018). Governments can regulate fossil fuel extraction in a number of ways. They can restrict leasing of state-owned lands and waters for coal, oil, and gas development, or elect not to develop specific resources or infrastructure (oil pipelines and terminals, coal ports, etc.) that would stimulate further extraction. Recent examples include the French ban on new oil and gas exploration, the joint Obama/Trudeau decision to place US and Canadian offshore Arctic resources off-limits for new oil and gas extraction, and Obama’s rejection of the Keystone XL oil pipeline, all undertaken to with an objective of greater consistency with global climate goals. As Erickson and Lazarus (this issue) show with a focus on the phase out of US fossil fuel leases might mean for global CO2 emissions, the climate benefits can be substantial. The most direct form of regulation would be to set limits on fossil fuel production. As discussed by Mathieu Blondeel and Thijs Van de Graaf in this issue, both China and the USA implemented temporary moratoria on permits for new coal mines, though in China, this was not ostensibly for climate reasons. In contrast, with a clear climate intent, several Pacific island nations in 2015 proposed “a new global dialogue on the implementation of an international moratorium on the development and expansion of fossil fuel extracting industries, particularly the construction of new coal mines, as an urgent step towards decarbonising the global economy” (PIDF 2015). Employing the COALMOD-World partial equilibrium model, Roman Mendelevitch (this issue) finds that a global moratorium on new coal mines could induce a coal consumption pathway consistent with a 1.5–2 °C goal, while also compensating current owners of coal resources through increased prices and rents. Regulatory approaches can also include explicit consideration of long-term emissions implications in the permitting and review of new production or distribution facilities. There have been increasing calls, including by key agencies in the US and Canadian governments, for more comprehensive examination of the global impacts of greenhouse gas emissions in environmental impact assessments, which some have term “climate test” for new supply infrastructure (White House CEQ 2014). For example, Jaccard, Hoffele, and Jaccard (this issue) develop a model to apply a climate test to new oil infrastructure and find that due to their cost and emissions, there is only a 5% probability that investments in expansion of oil sands capacity would be viable under a 2 °C constraint. Governments can also create instruments to acquire production rights and compensate resource owners to leave fossil fuel reserves undeveloped or otherwise restrict their production (Harstad 2012; Larrea and Murmis 2015). They can also restrict financing available to fossil fuel supply through their pension funds, investment funds, or support of multilateral finance institutions, as Ireland and Sweden have recently done, and Norway is currently considering. One way to limit fossil fuel supply is to pay resource owners to leave fuels in the ground. The Yasuní-ITT Initiative, proposed in 2007 by the Ecuadorian government, is the most prominent example of this approach. Ecuador subsequently submitted a proposal under the United Nations Framework Convention on Climate Change that countries be granted transferrable emissions credits for ceasing fossil fuel exploration and extraction (Köhler and Michaelowa 2014). However, the Yasuní-ITT initiative ultimately failed to generate the level of funding sought from the international community, and the market mechanism proposal did not gain traction (Sovacool and Scarpaci 2016). Fossil fuel production is deeply embedded in many economies, often viewed as central for development, energy security, export revenue, and poverty alleviation. Many fossil fuel-producing countries are heavily dependent on the associated rents and revenues and support the industry through subsidies and direct state investment. Fossil fuel producers comprise some of the world’s largest companies and wield geopolitical influence powerful enough to stymie energy and climate policies not to their liking. These challenges draw attention to the political dimensions of moving away from fossil fuels. Green and Denniss (this issue) explain how the power and interests of fossil fuel incumbents form a major hurdle in the shift away from fossil fuel production. However, they also show how a more nuanced understanding of the divergent interests of fossil fuel incumbents from new entrants may reveal surprising new political opportunities. In some cases, such as proposed moratoria on new coal mines, incumbents may benefit from and advocate for supply constraints. Two articles in this issue draw attention another important factor, namely how global norms shape appropriate behavior (Finnemore and Sikkink 1998) and how changing norms can alter the politics of energy and climate policy. In his contribution, Fergus Green observes the emergence of what he calls “anti-fossil fuel norms”. He documents the origins of such norms, which stem from activities by norm entrepreneurs and norm champions, ranging from environmental activist Bill McKibben to former President Anote Tong of the small island state of Kiribati, who spearheaded a campaign against new coal mines. Green argues that anti-fossil fuel norms can spread through the political mobilization by civil society at the domestic level and through tactics (e.g., persuasion, leading-by-example) by norm-adopting states to “socialize” other states, citing the example of the Powering Past Coal Alliance launched at the UNFCCC meeting in Bonn in November 2017. Like Green, Blondeel and Van de Graaf examine a more specific, emergent global norm—that there should be no new coal mines. While Green’s account of anti-fossil fuel norms is decidedly optimistic about their transformative power, Blondeel and Van de Graaf offer a more sobering assessment of how a new norm around limiting new coal mines has fared in five major coal-producing countries. They conclude that entrenched interests, political constellations, beliefs, and institutions have limited uptake of this norm in the countries they studied, but note that framing the norm in relation to non-climate issues (e.g., public health concerns) might further its spread. Transitions away from fossil fuels must account for social equity, addressing the impacts specific countries and communities (Caney 2016; Kartha et al. 2016; Moss 2016; Lenferna 2018). Would it be fair to expect fossil fuel-producing developing countries to forgo their expected economic rents and development plans based upon them (Lahn and Bradley 2016; Bos and Gupta 2018)? Or, as Sivan Kartha, Simon Caney, Navroz Dubash, and Greg Muttitt (this issue) put it more provocatively, can equity frameworks and principles tell us whose carbon is burnable and whose is not? While equity frameworks and principles have had a long history in the context of the responsibility and capacity to reduce fossil fuel emissions, they are underdeveloped for the case of limiting fossil fuel supply. Kartha et al. help fill this gap by suggesting that a managed decline in fossil fuel extraction needs to ensure that key developmental priorities are met, including the provision of energy services, safeguarding livelihoods, and allowing countries to diversify their economies, thus enabling a “just transition” for affected communities (Rosemberg 2017). Moreover, they suggest that international cooperation—following the principle of common but differentiated responsibilities and respective capabilities—will be key for supporting countries who forgo extraction. Measures to influence the pace and location of fossil fuel extraction—what we refer to here as “supply-side climate policy”—remain the road less taken by those seeking to achieve global climate goals. Focusing on fossil fuel combustion is a more direct way to address CO2 emissions, and doing so has seemed more politically viable than taking on powerful interests that benefit from the extraction and distribution of fossil fuels. Yet, it is increasingly clear that supply-side policies can bring important benefits. They can widen the mitigation cost curve, allowing greater emission reductions at the same (or lower) cost than demand-side policies alone. They can help address carbon leakage risks. They can reduce carbon lock-in effects, making it easier for lower-carbon alternatives to compete with fossil fuels, and weakening the carbon entanglement that makes it hard for many governments to adopt strong climate policies. Lastly, focusing directly on fossil fuels and the actors that supply them can bring added pressure to bear on climate change mitigation efforts and could help make the case for more ambitious global climate action. Indeed, as noted above, and in several of the contributions to this issue, some governments have begun to realize the benefits of adopting supply-side policies. 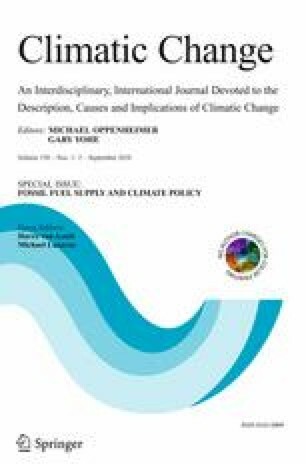 As this Special Issue suggests, the potential and limitations of supply-side climate policies deserve greater attention from climate policy researchers and practitioners. In particular, there is a need to understand how supply-side climate policies might work in specific contexts, including their economic and environmental impacts. Examples cited here, such as the French moratorium on oil and gas exploration, are a good starting point for such studies. In some cases, such as the reform of fossil fuel producer subsidies, oil export restrictions, or the shuttering of coal mines, climate benefits cannot be the primary rationale; nonetheless, important insights can be gained related to impact on global markets or on global norms, as articles in this issue suggest. In such studies, it will be important to reflect on the interplay between supply-side and demand-side climate policies and under what conditions they are likely to complement or undermine each other. Another key line of inquiry is how supply-side climate policy aligns with the carbon accounting and tracking systems that policymakers and observers use to judge effectiveness and take credit for action. While extraction-based accounting could provide a valuable complement to standard territorial emissions accounting, methods are still needed to better understand, track, and enable policymakers to take credit for the emissions benefits of specific supply-side policies. The political economy of fossil fuel supply and its implication for supply-side policy also deserves more careful attention; as this issue shows, doing so may reveal some unexpected implications. This requires examination of how fossil fuel markets work, how fossil fuel interests are entangled with national governments, and who stands to win or lose with the introduction of constraints on fossil fuel production. It is our hope that greater research attention to supply-side climate policies will help to inform policymakers and civil society on whether and how venturing down this road less taken could indeed, as we suspect it might, increase the prospects of achieving our globally agreed climate goals. We thank Peter Erickson and Kevin Tempest for their inputs. We thank Sida and the Swedish Research Council Formas (project: From Emissions to Extraction: The Politics and Governance of Leaving Fossil Fuels in the Ground for their funding support.